We sat there. Brief silence. Tears trapped. The topic was brought up again. We never know what strikes it. But there it is. Here it is. Silence. This time it was heavier. Thicker. Because his words floated. It stung. I told him it wasn’t his fault. I mentioned his super sperm. I said the truth. It’s my fault and we both know it. All this time he must’ve been blaming himself even with all the evidence. My heart sank for him. Infertility hurts everyone. Wives, be sensitive to your spouses. He may not tell you what’s on his heart. He may not want to hurt you any more than you already are. Be patient. Be loving. Be real. Be ready to listen. My husband and I smile when our friends say our child looks like either one of us. It’s amazing how God works. We are eternally grateful for the blessing to be parents to such a precious baby boy. But there’s always, always, that indescribable feeling that makes me wonder how our biological child would ever look like. Most importantly, love each other. Infertility hurts marriages. I’ve seen it make you or break you. So I urge you to pray together. Listen to each other. Stop and slow down. Sometimes all you have to do is stop fertility treatments all together. Sometimes all you need is a vacation. Sometimes all you need is some space. But you will ALWAYS need each other. I may be a 23 year old talking to you about marriage, infertility, faith, adoption, and the military and that all may sound silly to you but listen to me when I say this- your marriage will NOT fail if you have God in the center of your marriage. While you are on whatever journey you travel in life, take a second to refresh, look at your spouse, smile, cry, hug (do whatever you need to do), make sure you are on track with each other and pray together. Sometimes our marriage gets derailed in alignment with God. Life does that. Infertility does that. It leaves us with foggy minds, heavy hearts, and unsure paths. So take a second. Connect with your spouse and get on track with God so whenever life’s tough winds come trying to sweep your through, you are holding hands with no fear of the future. Remember the vows you made to each other on that special day- “for better or for worse, in sickness and in health, for richer or poorer, as long as we both shall live” and mean it. Betty, I love, love, love how open and honest and real you are. Your blog is so refreshing, even when the topics are tough. God bless you and your family, and thank you for sharing your heart! Thank sweet Elizabeth! It’s all been God’s peace allowing me to freely write this. Otherwise, I think I’d be too scared to share. Awesome. Awesome. Awesome. Yes….the perfect word to describe the above post (and the author) – once again your maturity and wisdom are AWE inspiring. I really love and respect your honesty. 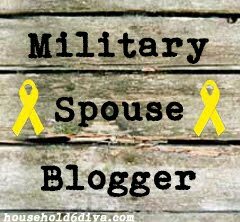 As a new military wife, and christian, reading your testimonies give me joy and encouragement. Thank you for doing what you do. Hi! Thank you for reading and sharing! Welcome to the military world by the way! Much blessings! I can’t explain how much I LOVED reading this post! I will be following your blog for sure. :) Thank you for your short, yet truthful blog post.